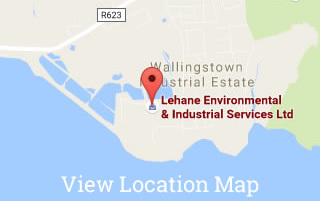 Lehane Environmental can supply our Mobile Bunded 20,000 Litre Stainless Steel Vessel with inbuilt stainless agitator, circulation system with automated valves operated from a PLC with remote access capabilities. The Neutralisation Unit has an Acid/Alkali dosing system with multiple pH controls to permit automatic discharge when set parameters are met. A Flowmeter manages restrictions on discharge limits. Lehane Environmental also have Portable Pump Skids available which are linked to PLC for filling a Vessel and for pumped discharge if the gravity is not sufficient. 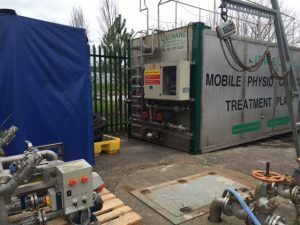 The mobile pH Neutralisation Tank can be linked to multiple balance tanks (either mobile or Clients existing infrastructure) and controlled from the PLC if required. 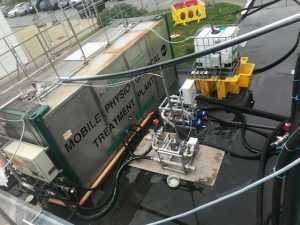 The Mobile pH Neutralisation Unit can be linked to 2 No. 30,000 litre balance tanks to provide for storage/balancing during peak periods of influent or treated water discharge. The unit can also be linked to the Client’s own WWTP Infrastructure if available to reduce mobilisation costs. Full site setup, management and operation can be provided by our team. For long term rentals, we can also provide training to enable use by Client’s Personnel once the equipment is setup. System can be configured to suit Client’s requirements with multiple balance tanks, mixer tanks, etc.